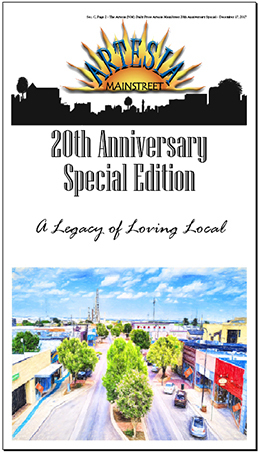 Purchase a copy of the Sunday, Dec. 17, edition of the Daily Press for the Artesia MainStreet 20th Anniversary Special Edition. It’s been 20 years since Artesia began its experiment with Main Street… the Artesia MainStreet program. Many of us lived through the early years of MainStreet – some of us as volunteers, others as observers, some as merchants who struggled through the days of construction. How times flies in progress! For those of us who reflect on that progress, it is interesting to realize that anyone born in this century does not know of a downtown Artesia before the days of the MainStreet program. Remember when parking spaces were not striped on Main Street? Remember when it was difficult to tell whether Main Street was really four lanes or just two? Remember when Heritage Walkway was a basically abandoned space? Remember when Heritage Plaza was an uninviting dark slab of pavement? Artesia MainStreet started as a group of volunteers ready to invest in downtown in order to add some energy and color, encourage more activity, and generally position the area as an appealing place to do business and generally hang out. In the process, many unlikely friendships shaped and many believers in the importance of downtown were developed. Today, we enjoy a downtown that many small communities across America envy — trees, slow traffic, crosswalks, office space, retail, no vacancies, great local businesses, a beautiful library, a great combination of new and old buildings, and a rich history of growth, activity and memories. Today, we may take all that for granted. We may have opinions about what could make our downtown better. While there is always room for improvement, I hope we all will take a moment to think about what is special about our downtown. Why is any downtown important? Historically, downtowns were the hub of a community, the place where it all happened – shopping, dining, working, entertaining. In today’s world, we think more globally as we turn to our computers, but the case may still be made… downtown makes a statement about a community’s vitality and sense of pride. Think about passing through a town that is not yours. When you see small local shops, people walking, and few available parking spaces, you will wonder what is happening. There must be something to see. An empty, inactive downtown won’t make you want to stop. Visitors from all over the country and New Mexico residents from outside Artesia provide the best testimony. We hear remarks over and over again about the delight of downtown Artesia – its beauty, nice small local retailers, stories of our heritage through bronze, and overall walkable space. We as residents should take time to enjoy it ourselves. Walk around downtown. Take some time inside our local stores. Go to the movies. Eat out. And, think about the treasures we have in our quaint and pleasant downtown. It is a place to see friends, do business, shop, and be entertained. It does not have everything. How could it? But, it is something special that contributes to the quality of our community and symbolizes the pride of our City of Champions. As a former MainStreet manager and a lifelong believer in the importance of an aesthetically appealing and vibrant downtown for a healthy community, I support Artesia MainStreet as it moves into its next 20 years of activity. Join MainStreet, if not as a volunteer, then as a proud user. Shop, eat, play, work, read, enjoy yourself, and make memories in downtown Artesia. Your presence there makes all the difference!